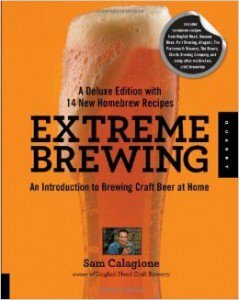 Beer Nerd Book Club: "Extreme Brewing (Deluxe Edition)"
This installment of Beer Nerd Book Club highlights Extreme Brewing (Deluxe Edition) authored by Dogfish Head founder/president and homebrew advocate Sam Calagione. The book is not only a glimpse into the mind and boil kettle of the diabolical genius Sam C., but (more importantly?) includes a bunch of awesome recipes from Sam, Dogfish Head staff, fellow brewers, and collaborators. The first half of the book gets into the basics of homebrew, walking the reader through the brewing process using a recipe of Dogfish's own. Sam then dives into topics like brew-friendly fruits, herbs, spices, wood, and bacteria giving his personal philosophy and experiential details along the way. Then come the recipes. And, man, are there some recipes! Sure, you get rad recipes for Dogfish Head beers like India Brown Ale and Midas Touch. You also get Sam's original recipes, many of which I have tried and have gone over amazingly well - the Peppercorn Rye Bock is incredible! On top of all that, this deluxe edition also includes more than a dozen new recipes from Dogfish Head collaboration beers with breweries like Stone, Victory and Russian River. I highly suggest it to anyone who loves Dogfish Head's beers and brew philosophy... especially for anyone interested in brewing outside of the lines. For an inside look at Dogfish Head and its roots in homebrewing see Brewing TV - Episode 63.